Substitute Michael Lyng converted a pressure free in the eighth minute of stoppage time to earn a replay for Cavan. The battling Breffni men will meet Tyrone again at Clones next Saturday to decide who goes through to the Ulster Football Championship final. Tyrone looked as if they had done enough to shade a dogged but gripping contest after Stephen O'Neill had given them the lead for the first time as the game slipped into added time. The Red Hands were in deep trouble, almost in disarray, until manager Mickey Harte introduced Brian McGuigan just before half-time. Just back from a four month spell in Australia, the Ardboe man immediately stamped his class on the game, and engineered his side's revival. Larry Reilly got Cavan moving with two early points, and both sides missed golden goal chances. First Jason O'Reilly blasted wide after being sent clear by Larry, and when Tyrone's Enda McGinley intercepted a Peter Reilly pass 40 metres from goal, be raced through unopposed, but his shot was smothered by goalkeeper James Reilly. Tyrone were struggling to get into the game, and when they did craft scoring chances, some woeful shooting let them down. Corner back Ryan McMenamin led by example with their opening point on 12 minutes, and although Stephen O'Neill did bring the sides level, it was the Breffni men who continued to force the pace, the early long ball paying off handsomely, with Jason O'Reilly and Larry Reilly both finding the target again. With just over half an hour played, Cavan had three points on the board, and the Red Hands, with eight wides, had scored just twice. But the introduction of Brian Dooher and Brian McGuigan had an immediate impact, the latter supplying the probing pass which sent McMenamin in for his second. Cavan led by 0-6 to 0-4 at the break, but had to soak up intense pressure from a resurgent Tyrone throughout the third quarter. But the Red Hands continued to struggle for scores, and just when Owen Mulligan had brought them level, Cavan struck for a goal. Jason O'Reilly played a one-two with midfielder Pierce McKenna before sliding a low shot past Pascal McConnell in the 52nd minute. Now Cavan led by 1-6 to 0-6. 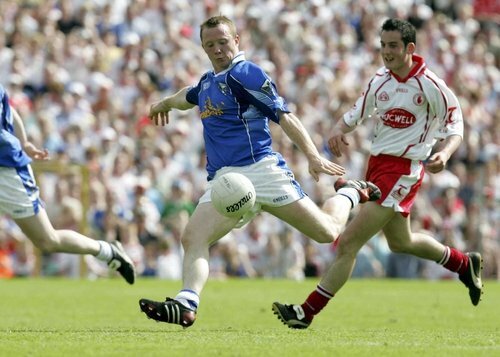 But, inspired by the vision and creativity of McGuigan, Tyrone scored four points (two from Stephen O’Neill and two from Peter Canavan) to assume the lead. However, Cavan, who had been playing with 14-men since Paul Brady’s dismissal for a stamp on Conor Gormley, were rewarded for a tenacious performance when Lyng notched the dramatic equaliser. Players from both teams had to be separated as tempers flared at the final whistle. Tyrone: P McConnell, R McMenamin (0-2), C Lawn, S Sweeney, D Harte, G Devlin, P Jordan, C Gormley, S Cavanagh, B Donnelly, P Canavan (0-3, 2 frees), M Penrose, O Mulligan (0-1), S O'Neill (0-4, 1 free), E McGinley. Subs: B McGuigan for Penrose, B Dooher for Donnelly, R Mellon for Dooher, J Devine for McConnell. Cavan: J Reilly, M Hannon, D Rabbitt, K Fannin, P Brady, Peter Reilly, Pauric Reilly, P McKenna, N Walsh, M Cahill (0-1), M McKeever, F O'Reilly (0-1, free), J O'Reilly (1-1), A Forde, L Reilly (0-3, 1 free). Subs: M Lyng (0-1, free) for Forde, D McCabe for F O'Reilly, J Tierney for L Reilly, S Johnston for Cahill.